When we began to discuss between us here at “Arsenal Analysis” which players really stood out during the season we were not surprised to discover that only five made the grade. The reason is that it has not really been a season to shout home about. A lot of the players used by Wenger were either playing below par or were youngsters trying to find their way into the team. A few stood out however. One such youngster that really made his mark was Kieran Gibbs. He only came into the first team in the last quarter of the season replacing Clichy who had to sit it out due to a bad back. Kieran played wonderfully improving with every game. What will Wenger do with Traore now? And of course there is Arshavin who has set the place alight since the end of January when he signed on the last day of transfer deadline. Those four goals against Liverpool were the highlight of his contribution. Pity Arsene decided that Andrey should not participate in the semi final of the FA Cup against Chelsea. However he has added that explosiveness and trickery that Arsenal were lacking in breaking 10 man defences down. It’s not a surprise that Arsenal started scoring goals by the bucketful ever since he stepped onto the Emirates stadium. If Alexandre Song had been fit enough or chosen early enough by Wenger to start games we feel that he would have been a prime candidate (along with Arshavin) to be Arsenal’s player of the season. He has been fantastic both in the centre of midfield or in central defence using his strength, tenacity and intelligent positional sense to shine in almost every game he played. He will be a regular next season but in which position remains to be seen…. Manuel has been the ever present and constant in this season’s Arsenal. He has improved so much he has earned the respect of most of Arsenal’s skeptical fans. He captained the team for the first time, in the UEFA Champions League match against Fenerbahçe in that 5–2 success and had a great game. Almunia's penalty saving abilities came into play in the Champions League game against Roma in which Almunia saved one penalty in the shoot out and Arsenal went on to win. His most impressive performance was against Manchester United in the UEFA Champions League, at Old Trafford where he single handedly kept Arsenal in the tie with some breath taking saves. Even though some fans may fault him for Manchester United’s second goal at the Emirates in the Champions League one cannot deny that his performances throughout the season have been generally consistent and impressive. This would have been the season that Robin could have had his biggest impact for Arsenal Football Club. However a combination of injuries and a disinterested attacking partner in Adebayor contrived to deny him the success he deserved. He has however shown the maturity and intelligence in his games this season that has allowed him to play with significant effectiveness both from his normal position behind the front striker or indeed as a front man himself. The result is 11 goals scored and interestingly 11 assists, the most of any player in the League this season. This tells you a lot about the potential this player has. Arsene Wenger has another dilemma now. Does he let Adebayor go without replacing him with Van Persie in mind? He already has a plethora of players at Arsenal who can play behind the front striker. Arshavin, Nasri, Fabregas to name but a few. Others that showed improvement but we felt did not qualify for the top five were Walcott, Nasri, Toure and Denilson. There are a few players that did not reach the heights of last season. These are Sagna, Clichy, Toure and the captain Fabregas. There were two players that we felt had a negative impact. One was Gallas with his stupid antics in the first half of the season which probably took away any chance we had of winning anything. The other was Adebayor who has been pathetic for most of the season, playing in second gear and generally looking uninterested. Where'd the Ade/Chav pre-contract story come from? I agree with most parts of your article. However, I strongly disagree that Gallas had a negative impact on Arsenal's season. If you remember (I'm sure you do) that when Gallas did speak out to the media was when we were on a bad run of form and he was the only one thinking of winning. The rest were out for a walk in the park. Gallas is the only winner we had in our team at the start of the season. Now we have Arshavin aswell. I'm sorry but your plain stupid to think that Gallas had a negative effect on the season. He as the captain had every right to say what he said and every word he spoke about the team was correct. He was the only player who cared about winning and what he did last season against Birmingham was fully justified aswell. If Gallas had an on-pitch arguement with Toure or any other player like Carragher did with Arbeloa for Liverpool, the media would make it out to look as if he was in the wrong, but because it was Carragher it was passion. You just follow the media..the media said Gallas was wrong for speaking out, you think he was wrong for speaking out. Use your own head. Stop being a sheep. I'd like to throw Gallas' name in the hat. From the time he lost the captaincy to his injury he was immense for us and really showed his professionalism. I actually believe his outburst was instrumental in our long unbeaten run. He spoke a few home truths that we Gooners ourselves were bemoaning. I hope he stays with us. In my opinion he is our best defender and not only that, gives fight when others do not. Thankfully Almunia gets some credit here - I saw a number of lists where he wasn't even in the top 5, which was ridiculous. Denilson should be in there. the most improved player: Almunia!! im not anymore affraid with him between the sticks.. and his nearing his peak.. hes calm and assured..
Gotta say that Sami Nasri deserves to be in there more than Arshavin. Arshavin had some storming games but even by his own admission wasn't at his best. Nasri has been a consistant performer as season and he's only gonna get better. In a season like this, what mattered most was consistency and quality year round -- Song and Gibbs were late comers; Arshavin would earn it if any silver had been won; RVP had a good year, but was missing at many times. My vote is for Denilson -- quality work all year, and key to saving the season and making the end possible. Second would be Clichy, then Sagna -- they were the rocks for Arsenal this season. Song and Denilson for me. WHO WAS LEAST POOR PLAYER OF THE SEASON???? !!! My nominees would be Almunia, Van Persie, Denilson, Gallas and Nasri. Arshavin's had a great impact but has played too few games to be considered for player of the season. Song's improved in the last couple of months but his positional sense isn't great. We've conceded one goal in two games against Man Utd with Denilson in the team (and that was just a late consolation) and four against them in two games with Song as defensive midfielder. Obviously that is slightly misleading because the performances of other players' also comes into play (like how good Gallas was against them at home in November) but in terms of defending I think Denilson is more effective than Song. You have no idea about football if you think Gallas had a negative impact on our season considering the fact that we were playing really well until he got injured at Villarreal, after which we endeavoured to lose against Man Utd and Chelsea, effectively ending our season. You can't put Gibbs as a real choice for player of the season and be taken seriously when he's played about 20 games, horrible article. Iv really enjoyed your blog this season but have to disagree with many off your points. Gibbs has only played a handful of games and while he's done well in a few of them he's had little impact. I guess the others have performed well over the season, although Van Persie's been very erratic, dreadful in about a third of our games as well as being brilliant in others. 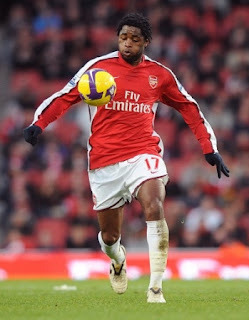 I actually had Willy Gallas in mind as our player of the season and am shocked at your comments on him. If you want to see his impact on the team why don't you compare what our defence was like leading up to his injury (about 5 goals conceded after christmas) and how it was after he got injured (Shambolic). He's clearly been our the one who's held it all together. who would you rather have? Sylvester and Gibbs lol? Song has improved but he is one of reasons we are so far behind the other top 3 clubs. As we head into the silly season, replete with transfer rumours both in and out, acrimonious boardroom tales and disgruntled players all whipped up to a venomous froth by Fleet Street’s poisonous pens, I think it is worth pausing and taking stock. Reminding ourselves of what has already been built by this prestigious club and luxuriating a little in what is to come. Having watched the youngsters imperiously dismantle Liverpool in the first leg of the FA Youth Final, it is clear the conveyor belt of talent from below is starting to deliver. ‘Arsene Wenger’s Magical Embryo Farm’ has a bountiful crop and one feels that we will be harvesting it’s goodness for years to come. Hopefully most fans are in a more reflective mood and will have tempered some of the gnawing disappointment of this season. Personally, I take solace in the belief that this is a manager working to a longer plan. A club with a different blueprint to the rest; treasuring stability and ‘long-term success’ above all. A club which identified the perfect manager for this task. A manager unlike any other in the world. There is not a football club in the world which would not want him at the helm. Even Man Utd, who clearly would never dump Ferguson, would love The Professor as a replacement for when Fergie retires - anything to address their spiralling debt. What is happening at The Arsenal is an exciting, intriguing and unique experiment in ’sustainable football’. Whilst clubs across Europe are going to the wall The Arsenal have become the vanguard that other clubs are looking at with awe, green eyed envy and begrudging respect. On the back of Wenger’s visionary acumen something unique has been built. As a result we lucky fans are better placed to reap the long term rewards than any other club in global football. The perils of big but poorly run clubs will be all too evident at the moment for fans of Newcastle. The cost of demotion from the Premiership is usually estimated at £50m - £60m and Newcastle are estimated to have the fifth largest wage bill in the division. A fire sale of players seems inevitable and one would not be surprised to see a protracted stay in the lower divisions. As we listen all too frequently to whingeing eejits complaining about the lack of on-field success one should hold fast to the belief that Wenger and his experienced support staff, know more about where the club is in terms of talent and progress than any of the ignorant, sensationalist Fleet Street hacks and the multitudinous buffoons of bloggery (with three braincells, two fingers and one, very negative, opinion). I concede that the disappointment of the last few seasons hangs in the air like a nappy on a stick. And it is understandable to be a little blue but the move to a new stadium, whilst competing against clubs who sold their souls and bankrolled their way to the top through financial doping, was never going to be walk in the park. So be it. We grit our teeth and we come back stronger. Fans, players and management alike. The doom-mongers will think they know better, but if you actually listen to the messages emanating from our beloved club, there are myriad reasons to be optimistic. In recent weeks, Wenger has accepted that the squad needs a little more steel/experience but we know this is really no more than 2 players, 3 at the very most. As Rafa moans away about not having the finances to compete against the likes of Man Utd & Chelsea I have read it claimed that Liverpool are looking for another 5! It strikes me that Liverpool’s biggest problem is a paucity of great players coming through the ranks. As the season geared towards a tense finale Wenger had been extremely bullish about his team - it is clear that he believes that The Arsenal will enter into an era of dominance in the near future. Some think this the words of an old fool but we must know by now he is anything but? The foundation of his belief is the talent he sees every week. An unprecedented hotbed of youth - pregnant with promise and bristling with balls. It may come to pass that Arsene’s greatest challenge was that which he faces now - finding the right blend, retaining some, letting others go and all the while balancing the first team squad. But this is because of the sheer weight of talent coming through which is now coming through, year upon year. That he is having to make these vital decisions amidst a cacophony of dissent from ’so-called supporters’, simply makes the task more stressful and arduous. I do not envy him this task. Come to that, having seen how much he truly cares, I do not envy him his position full-stop. Those who have lambasted him from the comfort of the sidelines (and yet know less about football than he has ever forgotten) would do well to remember that no manager has ever done more for this club and no man has ever cared more about it’s success. It’s easy to criticise until you have sat in the hot-seat and made the decisions yourself. It’s easy to say, for example, that we would have won the FA Cup if Arshavin had started (though it is still utterly speculative, as his anonymous performance against Man Utd last week showed). It’s easy to think other managers could do better until you look at Scolari & Ramos and the welcoming arms with which they were welcomed. Whilst this has been a difficult period for the fans - especially having come so close last season - there is for me a tangible sense of eagerness for the young crop to really blossom. Talk of tomorrow’s stars, if anything, only serves to make us even more feverish. We salivate like starving dinner guests: stuck on 4 years of canapes and starters, all the while yearning for the main course…we have had glimpses of it being prepared in the kitchen but somehow it has never quite reached our table. But this was always going to be a process which demands patience - we are going through growing pains, trying to balance the pecuniary needs of the club against a backdrop of unprecedented financial chaos, and the needs of the team with it’s army of hungry fans. “At the moment, what this team has done, with the average age we have now, no team has done that. The most important moment in the life of this club is to be strong now and support this team. At the moment, what this team needs is the support of people who are the fans of the club. That we have no trophies to present today, I’m very sorry”. How sad he felt it necessary to apologise. Perhaps a better way for Arsenal fans to appreciate his achievement is to view this as a journey - after all success tastes far sweeter when you have drunk from the well of despair (which amazingly is where some would have you believe we are now). Watching the crop of youngsters come through is, to my mind, a far more interesting experience than if we had splurged millions on spoilt-brat mega-stars who have no real affinity with the club. Not all of the enjoyment of football is measured in silverware. Those fans fans who are longer in the tooth (the one’s who tend to have a bit more perspective) will remember well the wilderness years between 1938 and 1948 and again 1953 and 1971. That’s ten trophyless years followed by eighteen! A sobering thought, as you watch the mountain of toys being thrown from prams all over the web. My dad, who celebrates his 80th birthday this August, is startled at the current furore whipped up by the media. As a wee lad he used to sneak into Highbury. He saw the glory of the Chapman years come and go and lived through those 28 trophy-parched ‘years of wilderness’. He would say that The Arsenal’s last two seasons have been excellent - playing exceptionally at times but in the end being beaten by good teams. Certainly he thinks that the football world has gone quite insane that there would be any Arsenal fan calling for Wenger’s head. But I digress, over the next few weeks, as a distraction to the pervasive negative nonsense, I plan to focus on a few of The Arsenal’s young hopes, those who have particularly piqued my interest over the last season. Hopefully you’ll find it of interest. Watch this space and for God’s sake! Stick by Wenger and the team - it’ll honestly be much better for your health and happiness if you just enjoy the ride. I think Denilson would be a better choice than Arshavin for this Arsenal's player of the season polling. Anyways, my vote definitely goes to Almunia!